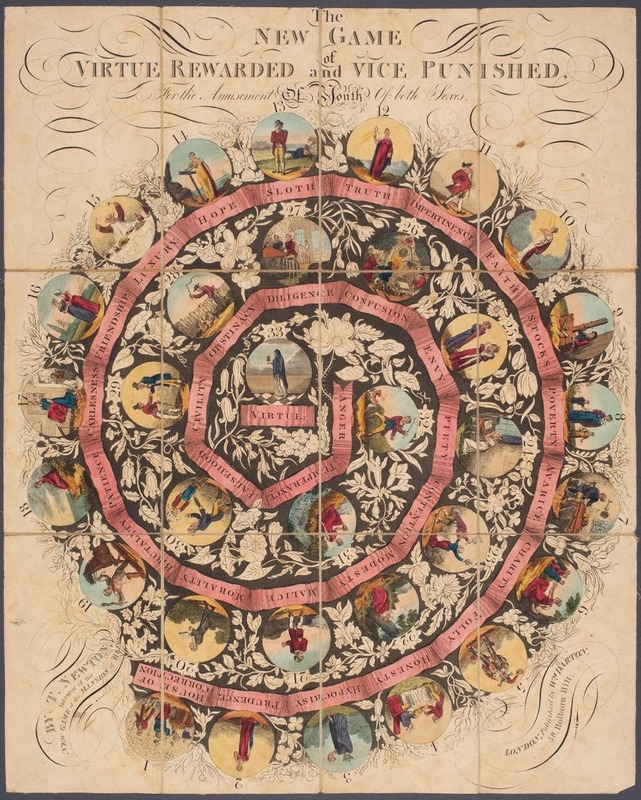 This is the playing board for The NEW GAME of VIRTUE REWARDED and VICE PUNISHED, published in London in 1818. The goal of the game was to teach morality to children, with bad qualities like Sloth, Hypocrisy, and Impertinence alternating with desirable behavior, such as Patience, Hope, and Diligence. There appear to be more bad things to be avoided than good ones to emulate (true to life, I suppose), plus some vivid consequences of badness like the Stocks and the House of Correction. The ultimate goal in the center is Virtue – and unlike today, Luxury is considered a negative in 1818.